I love fresh pork tamales and there are none better than the hand made ones you get at Alamo Tamales at the intersection of FM 2351 & Texas 3 near Webster. There are other places in the Houston area with variations on the name Alamo Tamales but this is the real one. They have other kinds of tamales (chicken, brisket, etc) but I only get pork. A friend likes the ones from HEB. They're bigger and good if you can't get Alamo's. It's a little far to drive, to Alamo so we usually get a dozen and freeze the extras. My problem was that I had trouble coming up with a way to reheat them so they were like fresh. I experimented with a few ways until I came up with this one. I steam them. Reheated this way they're very close to fresh. This may have been obvious to real cooks but I'm not. You need something to keep the tamales above the water. 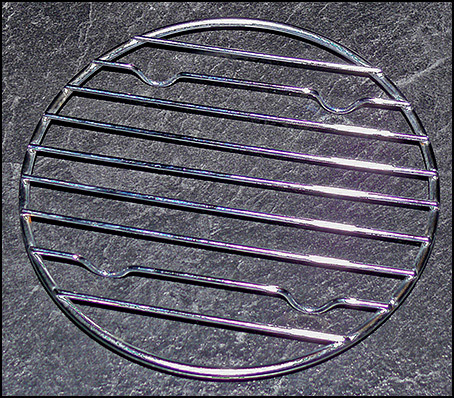 I found this grill-trivet-like thing here on Amazon. It fits in the 3 quart sauce pan shown below. I originally did this in a slow cooker but it was too slow, so I switched to the sauce pan. This trivet isn't ideal, it's feet need to be half again to twice as tall. If you aren't watchful the water can boil away, but it was the best I found while experimenting. It would be simpler if you used a steamer like this one but it's more expensive for something I don't do routinely and it takes up space we don't have. I'm considering getting this steamer rack and using a Dutch Oven. UPDATE: I ordered it, but is was too big for out Dutch Oven. 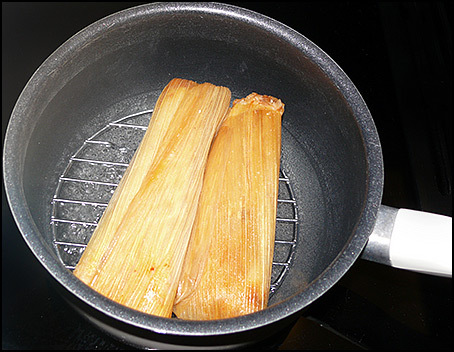 Add water to the reach the bottom of the grill wires, Put it on a burner on high until it begins to boil then turn the heat down 'til it's barely boiling, add the tamales and the lid. 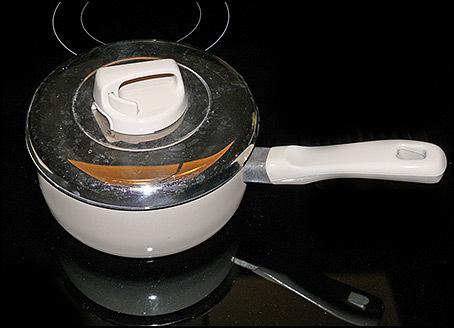 Leave it steaming for 12-15 minutes 15 min. for HEB's (it's almost impossible to steam them too long). 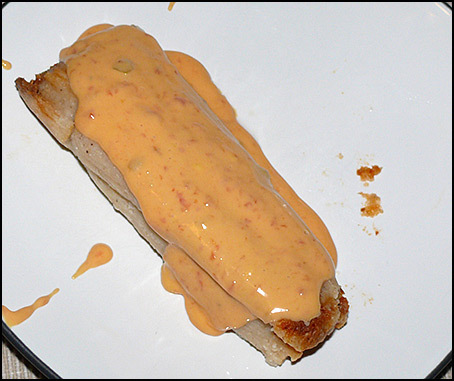 We top them with a cheese sauce made with Ro*tel Original Diced Tomatoes & Green Chilies plus Velveeta using this recipe (We use a reduced amount of the recipe and we put the Ro*tel in a blender. ).